recent study estimated the cost of mitigating fertilizer pollution in the Mississippi River at $2.7 billion a year. 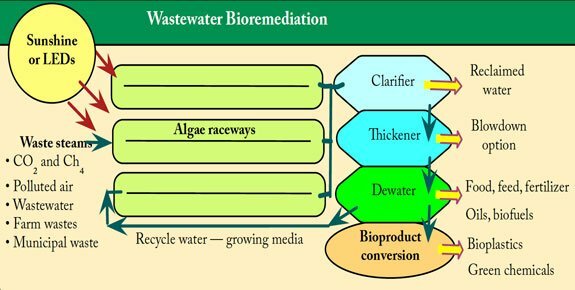 The use of algae bioremediation in algae biosystems, could reduce that annual cost by a factor of at least 10. 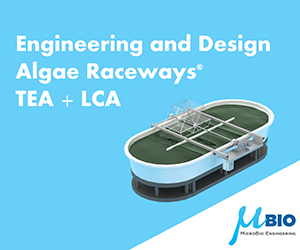 A wastewater bioremediation system uses algae raceways to allow algae to biosorb the nutrients from organic waste. Algae biosystems can remove N from water. A study on closing nutrient cycles using algae at the Netherlands Institute of Ecology demonstrates that microalgae can effectively recover nearly all the P and N from anaerobically treated black water, (toilet wastewater). 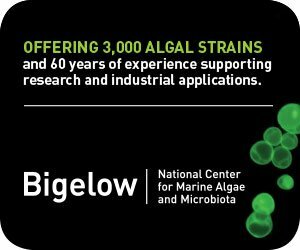 An algae biosystem captures the nutrients and generates algae biomass in one step. Screening experiments with green microalgae and cyanobacteria showed that all tested microalgae species successfully grew on anaerobically treated black water. A subsequent experiment in flat-panel photobioreactors, showed chlorella removed 100% of the P and N from the medium. Frank Rogalla has developed a wastewater-to-biogas plant in Spain. The facility grows algae in saline wastewater and harvests the algae oil. His team worked out the metrics and concluded the process achieves a positive energy balance. This energy and cost efficiency makes algae-waste-to-energy a significant commercial viability. 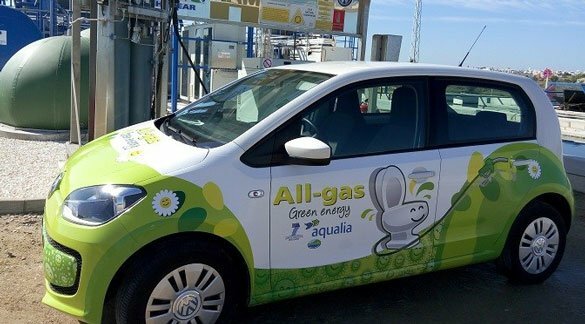 Frank Rogalla and his team at Aqualia produced the algae oil used for the first Volkswagen powered by algae biogas. (above). 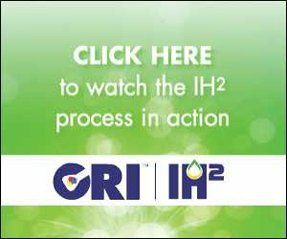 The team produced All-gas, (algae in Spanish), from the waste water treatment plant located in El Torno, Chiclana, Spain. The vehicle’s efficient hybrid engine generates zero emissions. Jordan Lind and a team at Clearas in Montana have developed a biological nutrient recovery system from wastewater that increases dissolved oxygen, and produces no chemical by-products, eliminating costly disposal fees. The patented process accelerates photosynthesis, consumption of CO2 and excess nutrients. 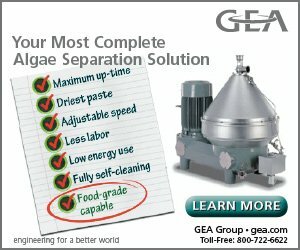 Advanced microfiltration filters out the activated algae, which can be used for a variety of bioproducts. The Clearas site provides a video of their process.